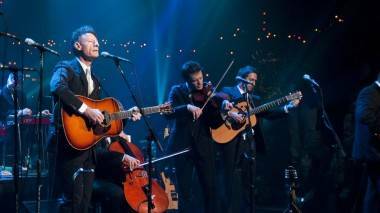 Lyle Lovett and His Large Band on Austin City Limits, Nov 8 2010. 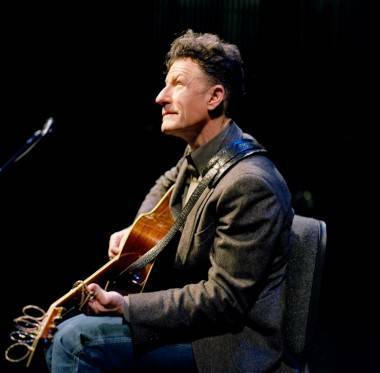 Last night’s concert by Lyle Lovett and His Large Band (a whopping 10 musicians, four singers, and Mr. Lovett himself) at the Vancouver Centre for the Performing Arts was an authentic Southern-fried feast, an audible smorgasbord of the richest genres of traditional American music served by one of its foremost interpreters. Lovett is known mostly as a “country” music artist – walk into any music store and there is no question that is where his discography will be located. However, to categorize him so narrowly seems like some sort of misrepresentation, as his aesthetic is far broader as not easily defined. Incorporating elements spanning the classic American songbook, Lovett and his band borrowed pages spanning blues, jazz, country, soul and beyond to create a concise sonic experience that can be best described as “pure Americana”. In addition to a fantastic music sensibility, the sometimes actor (a favourite of the late Robert Altman) managed to direct the course of the show with his innately warm, funny, charming character. Surrounding himself with an impressive assemblage of accomplished musicians, some of whom he’s been performing with for over 30 years, Lovett was chatty and talkative throughout the course of the evening. He verbally engaged with his many bandmates as well as the crowd, creating a delightful feeling of intimacy in a space that would have easily gobbled up performers of lesser talent. His chattiness seemed somewhat dictated by the organic nature of his music; in between most every song he required time to re-tune his guitar, prompting one audience member to shout, “That’s Vancouver humidity!” “The problem with beautifully engineered acoustic halls like this is… you can hear every note,” he happily explained. As soon as I found myself wondering what the band would have been like in a more traditional club setting, Lovett began fondly reminiscing about playing “the old Commodore, before the renovation,” circa 1988. “I know you think it is summer here… that’s sweet,” joked the Texan. The evening saw a myriad of musical high notes, Lovett both coaxing and at times demanding solo performances from each of the musicians on stage. The band sounded best when they performed as a whole, from the hauntingly powerful and strong “I Will Rise Up” to the jovial “Farmer Brown/Chicken Reel”, complete with chicken-clucking choral notes. One section of the evening saw Lovett three friends singing around a single microphone, a refreshingly organic and old-school style that fit the clever “Keep it in Your Pantry” perfectly. Lovett noted how he enjoyed performing thusly, minus the intrusion of technology, saying “If you don’t do it regularly, you should.” Taking a break towards the end of the show Lovett left vocal duties to the lone female in the troupe, blues mistress Francine Reed, who absolutely slaughtered onstage with her incredibly sassy, salty vocal work on “Wild Women Don’t Get the Blues”. By the end of the two-and-a-half-hour-long set, the notably silver-haired crowd (so sedate at the start of the show) were toe-tapping, hooting and hollering with such a revivalist zeal that they threatened to tear the roof off the joint. This entry was posted in concert reviews, Homepage Features and tagged concerts, Lyle Lovett, reviews, Vancouver. Bookmark the permalink.